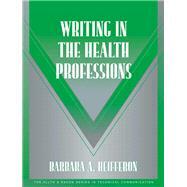 Practical, applied, and up-to-the-minute,Writing for the Health Professionsteaches students, healthcare professionals, and professional writers the essential skills in medical and health communications.Writing for the Health Professions looks at a wide range of health professionals¿ writing needs, including visual and electronic forms of communication, necessary in today¿s high-tech medical and health writing situations. The text addresses writing situations found in hospitals, clinics, HMOs, health insurance companies, and other health specialties. Covers a variety of genres including charting, patient histories, progress notes, procedural reports, handbooks, newsletters, brochures, websites, proposals, grant writing, and more.Those interested in learning the basics of medical and health communication. How Do I Begin to Analyze? How Do I Determine the Context or Rhetorical Situation? How Do I Determine Audience Needs? How Do I Choose Research Tools? Why Do I Need to Be Aware of Ethics? How Does Ethics Affect Medical Writing? What Are Other Examples of Ethical Situations? What Is AMWA's Code of Ethics? What Copyright Issues Concern Health Writers? What Do I Need to Know About Duplicate Publication? What Do I Need to Know About Copyright Law? What Digital Copyright Issues Must I Know? What Are On-line Ethics and Etiquette? How Do I Write for Differently Abled Audiences? How Do I Write for Multicultural Audiences? How Do I Protect Patients' Rights? How Was HIPAA Phased In? What Are Patient Bills of Rights? What Should I Do to Ensure Good Document Design? What Principles Do I Need for Designing? How Do I Talk About Visual Document Design? How Do I Manage Large Projects? How Do I Manage Communication Flow? What Should I Know About Patient Charts? What Is Clinical Decision Making (CDM)? What Is the Heuristic That Makes Up a Chart? What Does a Patient History Include? What Does the Physical Examination Include? How Is the Physical Examination Recorded? What Are the Capabilities of On-line Charting? How Are Encounter Forms Customized? What About Forms That Patients Fill Out? What Are Well-Designed Traditional Materials? What Are Well-Designed Healthcare Handbooks? How Are Booklets and Magazines Designed? What Do Good Newsletters Look Like? What Do Well-Designed Brochures Look Like? What Other Health Materials Are Available? How Do I Find Reliable Health Web Sites? How Does a Team Identify and Analyze a Problem? What Ethical Considerations Are Important? How Does a Team Develop Good Analyses and Proposals? How Do We Implement Our Research Plan? How Do I Include Multiple Perspectives? How Do Multiple Perspectives Change the Agenda? How Are Campaign Proposals Different? How Can I Implement Projects Effectively? What Media Choices Are Best for Campaigns? What Are Some Possible Strengths and Weaknesses? How Can I Troubleshoot a Campaign? What Assessment Techniques Should I Use? How Do I Debrief and Learn from a Campaign? What Grants and Foundational Support Are Available? How Do I Get Started on a Grant? What Are the Basics of Grant Writing? What Is the First Step After I Have Located a Grant? What Writing Style Do I Use in a Grant? What About Outcomes and Assessments? What About the Qualifications Section? How Do I Prepare a Grant Budget? What Are Red Flags in a Budget? What Is a Good Caveat for a New Grant Writer? Why Aren't Government Documents User Friendly? How Do I Rewrite Government Documents? What Is the Role of Documentation? What Pharmaceutical Documents Are Necessary? How Do Insurance Documents Differ? How Does Insurance Communication Work? Should Messages Be Local or Global? How Do I Find Particular Cultural Data? What Research Methods Are Best for Cultures? What Are "High-Context" and "Low-Context" Cultures? How Do I Avoid Offending Demographic Groups? How Will Computers Impact Other Cultures? How Long Has Visual Communication Been Used? How Do I Decide Whether to Use Illustrations? What About Creating Illustrations Using Computers? What Do I Need to Know About Photographs? What Visuals Are Most Important? How Do I Construct Tables? How Do I Decide Whether to Use Tables? How Do I Format Tables? What Kind of Information Is Best for Graphs and Charts? How Do I Format Graphs and Charts? What About Flowcharts and Molecular Graphics? How Long Have Hospitals Used Computers? How Are Web Sites Used in Medicine? What Kinds of Designs Are Best? How Do l Write Software Documentation? How Do I Write Tutorials? How Do I Write a Procedural Tutorial? How Do I Write a Reference Tutorial? How Do I Design Multimedia? How Are Videos Used in Healthcare?